Pick performance is one of the most important KPIs in any warehouse, especially as the number of SKUs stocked and handled skyrockets under e-commerce demands. Reducing time and motion while increasing the speed and accuracy of picks is key to optimizing operational productivity. In an environment where space is almost always a scarce resource, that can be a delicate balancing act. That’s why one of the most cost-effective and productivity-enhancing fulfillment practices is back-to-front pick face replenishment via gravity-fed carton flow racks. Bulk to pick: Obviously, stock must be moved from its storage location to replenish pick stations. Having pickers travel to storage locations to replenish their station wastes considerable time and motion, and housing stock temporarily in waiting zones until it is needed wastes space and creates congestion. In contrast, back-to-front replenishment provides a planned, organized way to keep needed stock accessible. Pick efficiency: Pickers can’t pick stock that’s not there. Back-to-front replenishment ensures that ample stock is on hand, properly arranged, and easily visible and accessible to meet the shift’s picking needs. What’s more, when product is loaded from back to front, picking activity is not interrupted, keeping pick speeds and volumes running like clockwork. FIFO: Replenishment from the back is ideal for first-in, first-out environments because top-off replacement flows from the feed side to the pick side, keeping inventory in proper circulation. 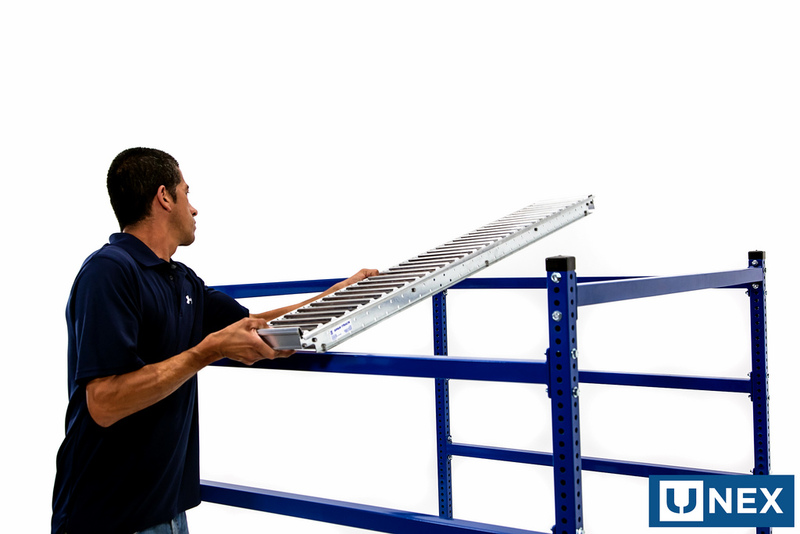 Simply put, carton flow rack systems are central to any distribution center, efficiently storing and organizing product until it’s ready to ship. Because inventory is replenished from the back without interrupting order picking in front, inventory flows smoothly and steadily, ready to meet demand. That makes carton flow systems the best approach for virtually every DC. UNEX Carton Flow Systems with Roller Racks increase order picking rates and space with faster pick rates that frees up warehouse space for additional SKUs. Inventory is replenished from the back without interrupting order picking in the front. Carton Flow systems also support FIFO inventory – first in, first out, so that products with expiration dates have the oldest dates picked first. Want to replenish from the back to smooth picking operations? Contact your UNEX Pickologist today.